Set your songs free to enjoy music in more places with the SA-NS400 HomeShare network speaker. Built-in wireless capabilities make it simple to stream music from your mobile device, computer, home theater system and more to any area of your house - so wherever you get Wi-Fi, you can get music. 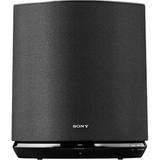 Sync with other network speakers to play the same song in every room (perfect for parties! ), and control it all with a FREE app that transforms your smartphone into a handy remote. And with four outward-facing tweeters integrated into an omni-directional design, you can place this speaker tabletop and enjoy from anywhere.